If you do not run your own mail server the most efficient place to have your domain name and email hosted is with your Internet Access Provider like Skyway West. To effectively manage, support and troubleshoot your email it is important we have immediate access to your email dns entries and the ability to edit them without delay. We can more quickly resolve mail and domain names problems because hosting elsewhere introduces many variables beyond our control. 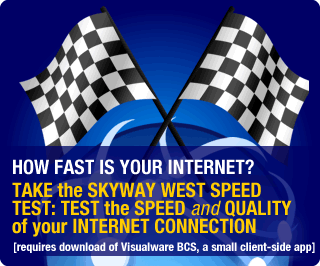 It is faster and more reliable to download email from Skyway West because you would download directly from our mail server instead of needing to take a longer route. 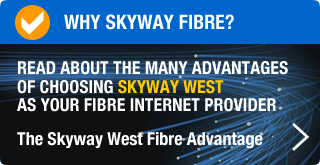 Downloading mail through Skyway West’s redundant network is more reliable because if the Internet connection to the foreign mail server is down your internal mail will also not function. You eliminate this risk by using our Network for your mail traffic. Although there are benefits to hosting your web site on our web server it will not affect your email to have your web site hosted elsewhere. Web hosting only entails a www dns entry and is easy to manage for you at any time. Most companies feel the most important aspect of their Internet access is reliable email.